In 2011, the National Highway Traffic Safety Administration (NHTSA) issued a final rule to reduce ejection deaths caused during vehicle rollovers. These “ejection mitigation” safety standards resulted in a variety of proposed solutions by special interests groups and automotive manufacturers. One idea favored the installation of laminated glass (similar to windshields) throughout the entire cabin of a vehicle. For the tactical community, this began a series of speculative arguments about how the switch could impact the use of vehicles as cover during a firefight. However, results from NHTSA testing indicated that laminated glass throughout a vehicle was not enough by itself to mitigate passenger ejection. Instead, the NHTSA’s solution was for automotive manufactures to install side door curtains that upon activation prevent passenger ejection. Immediately, appeals were submitted. Rather than paying to design and develop the curtains, companies opted for the cheaper solution of installing laminated glass throughout an entire vehicle. These appeals were denied and the safety curtains remained the mandate. Still, the brief fight for laminated glass continued to confuse tactical discussions regardless. Of the more recent is the assumption that all newly manufactured vehicles will be required to have laminated glass installed throughout the cabin by September 1st, 2018. This error results for two reasons. The first is misreading the NHSTA’s original final rule published in 2011 and subsequent published appeals in 2013. Second is the misinterpretation of the non-mandated yet gradual increase in automotive manufactures that are transitioning to front row laminated door glass in newer vehicles. Mistakingly, the steady introduction of these cars are assumed to be manufactures that are adjusting for scheduled compliance set forth by the NHSTA in 2011. Manufacturers that add laminated glass to front row doors are doing so absent of NHSTA mandate. There is no requirement for vehicles produced after September 1, 2018 to possess laminated glass in front and rear rows. Still some manufacturers are adding it regardless. So what does this mean for close quarter firefights around vehicles? Certain departments are upgrading their fleet of patrol cars with front row laminated door glass. Despite the modification, counter-ambush techniques for shooting through a windshield can be used as a basis for shooting through laminated door glass. Reacting to an ambush can require an officer to immediately shoot through the windshield of his vehicle. 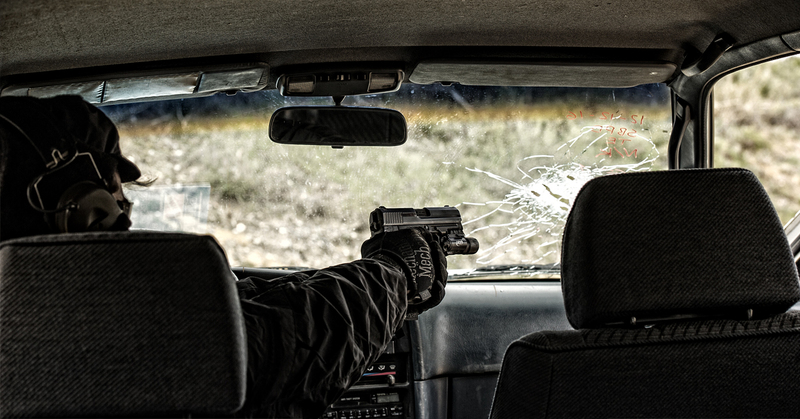 Because windshields are designed to absorb force, their safety characteristics during a collision can actually be life threatening in a firefight. In order to defeat a windshield, an officer must rapidly port the glass with high volumes of fire. This allows successive bullets to maintain better integrity as they pass through a hole created by previous shots. Although porting is effective, a primary consideration often ignored while rehearsing this technique are the effects of movement. Because paint rounds used during force on force fail to penetrate laminated windshields, and because most departments do not possess expensive moving target setups, an officer might not be taught how this technique needs to be immediately modified should the opposition become mobile. While tracking a moving target across a windshield, an officer will need to port new glass with each shot taken. Although this can be accomplished with rapid shot placement or with duty ammunition, it demands that an individual possess high levels of situational awareness. In training this can be accomplished by gaming a drill (e.g. “I know I’m going to shoot on the shot timer”). However, this is not an honest representation of situational awareness and its degradation due to lethal stress. During the Guerrilla Approach High Threat Environment Vehicle Tactics course, we highlight these effects by forcing an artificial delay on the shooter’s draw time (e.g. waiting a second), thereby showing how quickly a target can maneuver to a flank. We also allow moving targets to move in an unplanned direction (e.g. left instead of right) so that a shooter needs to react to the unexpected stimulus. Although these actions take place within the vacuum of the flat range, they demonstrate the limitations of attention during lethal events. In vehicle’s with tempered door glass, the opposition actually increases his exposure as he steps out from behind a laminated windshield. Whether moving on the driver’s or the passenger’s door, a threat that is behind tempered glass will be easier to neutralize. Unlike laminated glass, tempered glass in vehicle doors will break when shot. This allows bullets to maintain their form and possibly achieve first round hits. This is not to suggest that officers capable of shooting at a moving target through a windshield choose not to. But instead highlights the need for an awareness to the actual effects that bullets will have. As is such, shooting at a fast moving target through a windshield may reduce an officers ammunition supply absent of causing any physical harm to the threat. However, an officer seated behind both a laminated windshield and door glass must consider his defensive shooting techniques. If shooting a static threat to the flank of his vehicle, an officer can apply a similar style of rapid fire shooting through laminated door glass as he would a windshield. This must be done in both freestyle and strong hand configurations since certain flank shots can be accomplished quicker with just the strong side firing hand. Regardless of shooting a static or moving target from a seated position behind laminated glass, an officer must always remember the importance of movement out of his vehicle. In these types of close quarter engagements, either the (1) officer is killed (2) the officer and the suspect are killed (3) the suspect is killed or (4) both the officer and the suspect continue the fight on the street. Traditional exercises in which an officer shoots through a laminated front windshield or even tempered door glass can ignore these considerations. Consequently, an officer can misinterpret the purpose of the technique because he places a premium on shooting his firearm instead of understanding the effects of glass on bullets. More importantly, threats that move will eventually pass beyond the degree to which an officer can twist his torso. Although an officer might be able to awkwardly move in his seat to acquire sight picture on a static target in training, this is often at the expense of time. Under these circumstances, it can be more important for an officer to exit his vehicle to clear his bore while simultaneously increasing options for mobility. Training recommendation: for departments with patrol cars that possess front row laminated door glass, practice unholstering and taking seated strong hand shots with high volumes of rapid fire. This simulates defeating laminated door glass on an officer’s flank. Building up to this exercise may require the execution of flat range drills in which an officer just practices strong hand weapon manipulation. When officers anchor themselves to their patrol car during a shootout, there is an argument that suggests they do so out of a false sense of security. Because the patrol car is familiar officers attempt to stay close to it. Although a limited argument by itself, it can be expanded upon to understand why individuals remain static despite it being a hazard. Whether stepping outside of their vehicle and suddenly receiving fire, or having already posted up behind a patrol car in a defensive position, individuals that remain static in mobile fights do so because they feel task saturated. Lethal stimulus can overwhelm an individual’s senses. Although we assume this would elicit a fight or flight response, it might actually just trigger a freeze. Of course, remaining static isn’t always bad. You definitely do not want to hastily move from a bad situation to a worse one. But in counter-ambush situations, static fighting positions can be lethal. To encourage mobility in training, officers are typically taught to ditch their vehicles because they provide insufficient cover. However, framing vehicle abandonment as a result of inferior cover often results in spiraling debates about whether vehicles are or are not cover. Regardless, debating about the cover characteristics of a vehicle caught in an ambush distracts from the real issue: becoming pinned down by enemy fires. When used for ballistic protection, all positioning around vehicles is reduced down to density. Put as much material between yourself and the opposition and always look for the next piece of terrain that can be used for cover. This is true whether fighting around sedans, up-armored suburbans, or fully armored tanks. More importantly, regardless of your vehicle’s armor rating, allowing yourself to be pinned (even behind bullet proof vehicles) is dangerous should the fight become mobile. This reality initially caught coalition soldiers off guard during the early phases of the Iraq war. The up-armored gun trucks that gradually replaced the soft skinned vehicles used during the invasions created a false sense of security. Although these vehicles provided better protection from small arms, they also limited usable shooting positions for return fire. Unable to stand over the top of these trucks, and the urban environment limiting the viability of shots placed underneath a vehicle, soldiers were mostly limited to shooting in kneeling positions at either the front or rear bumpers. This is why Special Operations shooting schools place such high emphasis on reverse kneeling positions. When used around vehicles, reverse kneeling allows soldiers to greatly reduce their silhouette while simultaneously using the vehicle for stability and protection. Although law enforcement officers are not expecting to shoot it out around up-armored vehicles, similar effects of predictably occur when shooting around any car. Even the most unskilled opponent can intuitively assume that an officer using a vehicle for cover is limited to shooting around either the front or rear of the vehicle. However, tempered door glass allows individuals to take up veiled positions on a vehicle’s flank. From here an individual will forfeit ballistic protection, but in exchange is able to place shots through the vehicle’s cabin. Even when two layers of tempered glass need to be penetrated, first round hits are still possible. But when a vehicle possesses laminated door glass, this option is almost entirely invalidated. Unless he is taking immediate life saving shots at close proximity (e.g. the threat is on the other side of the vehicle) an officer will run into similar issues of porting as explained during the interior shooting positions recommendation. In training, dual layered laminated windshields can be defeated. But the time it takes to accomplish this might be better served repositioning to clear your bore or instead moving to new terrain. Training recommendation 1: prepare for the mobile close quarter fight around a vehicle by having a shooter practice immediate, but progressive movement into shooting positions around a car. It is important that a shooter not be told to flop into and out of positions that would not logically follow each other during a firefight. For example, if tracking a target from left to right, a shooter should practice immediately departing either a standing or kneeling position, move across a vehicle’s cabin, and assuming either a standing or kneeling position on the opposite bumper or flank. This attention to detail is paramount because it ensures that a shooter mimics practical real world movements during a firefight, instead of enthusiastically flopping in and out of different positions with no specific reason other than to immediately flop into and out of position. Training Recommendation 2: place two windshields in a row. Leave space in between to mimic the cabin of a vehicle. Shoot with varying small arms calibers and ammo types to identify the speed in which dual layered laminated glass can be defeated. Snipers will need to account for the unpredictability of first rounds fired through laminated door glass. Although certain ammunition types are better at maintaining a bullet’s trajectory, the effects of spalling will need to be catalogued and adjusted for. This will be similar to existing training in which snipers shoot through windshields. However, ensure snipers account for the difference in curvature of a windshield and the more vertical orientation of laminated door glass. Training recommendation: identify the different effects between ammo types, calibers, and angles of shots (to include elevation). If the assault element has overwhelming force on target, not much will change. Laminated door glass will require contact elements to carry either firefighter hand saws or battery powered saws. Regardless, the solutions for defeating laminated glass are inexpensive and do not require technological sophistication. Many fire department and EMT crews are capable of removing entire windshields within seconds using just hand saws. However, vehicle interdiction against cars with laminated door glass will create greater issues for low visibility teams. These teams, sometimes numbering as few as two individuals, rely on speed and surprise to accomplish a takedown. Although this can still be accomplished, it will require critical attention to detail during rehearsals. Training recommendation: rehearse team standard operating procedures as per opposition’s most likely to most dangerous courses of actions. Identify specific roles and exact positioning of security personnel in both the cover and the contact element. Identify the specific change in position by the breacher due to the use of a saw. Can the officer pulling security in the contact element still do so? Or is the breacher’s torso in the way because of how he must cut the glass? Rehearse, rehearse, rehearse. ISIL sympathizers have demonstrated their preference for using vehicles as the actual weapon for an attack. Officers will face a difficult task should they find themselves attempting to use small arms to defeat either laminated windshields or door glass on a moving vehicle. Regardless of the presence of laminated door glass, vehicle borne weapons by themselves should cause necessary discussion about duty ammunition selection and patrol rifle availability. Although an imaginative training solution would be an apparatus that allows officers to shoot at a moving target through laminated glass, such a device is unnecessary. A more practical solution is marksmanship training that teaches high volumes of fire, but with controlled shot placement. This will require a departure from the traditional mentality of shooting bullseyes for department quals, or low intensity static training that only demands two rounds to be fired at paper and a single round at steel. Additionally, the use of a “poor man’s moving target” can be used by positioning multiple static targets behind propped up laminated glass. In these types of drills, static targets are aggressively swept from side to side. Each target does not represent an individual threat, and instead is a method for replicating a moving target absent of actual moving targets. When shooting, an officer is encouraged to place rapid fire downrange rather than precisely porting glass for each static target. Training recommendation: Setup a “poor man’s moving target” by positioning three paper targets side by side. Next, prop up a windshield in front of the target. At distances between 10-25 yards, have an officer shoot through the windshield as quickly as possible. Shot placement shouldn’t be sporadic and loose, but should not be so slow as to counteract the learning objective of rapidly defeating laminated glass. In order to mitigate unrealistic performance expectations, this training design must be supplemented with the realities of attempting to neutralize a vehicle moving at high speeds. As a result, officers might be able to shoot at a moving vehicle, but it not be practical due to the target’s speed or objects positioned in the background. As automotive manufacturers increase the production of vehicles with laminated glass in front and eventually rear rows, we should not expect to see a significant change to vehicle tactics. Although it is necessary for law enforcement officers and tactical teams to be detailed oriented, a slight modification in the tactical environment should not cause for a complete overhaul of team tactics or standard operating procedures. These types of knee jerk reactions are representative of the procedures based training approach aka the September 10th training mindset. When trained this way, an individual (by no fault of his own) is conditioned to regurgitate sequences. Instead, training should focus on developing an adaptive mind that can handle any number of issues on the objective. Only the addition or removal of significant technological resources should warrant the complete change of tactics. For example, criminal use of commercial drones to block radio communications would require an examination of new SOPs. But for now, an added row of laminated door glass shouldn’t cause major hiccups.